“Everything is connected.” That’s the motto of Dirk Gently’s Holistic Detective Agency, a mantra of interconnectedness that the new BBC America series never tires of repeating. Sometimes it makes its claim with a surprising elegance, tracing a delicate line from one bizarre, seemingly insane event to another. Other times, it simply shouts the words at the viewer, before rushing off to its next big idea. 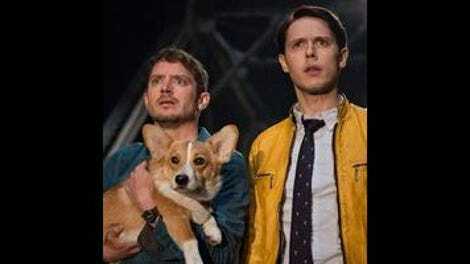 The main proponent of said philosophy is Dirk Gently himself (Samuel Barnett), an apparent detective who solves cases by wandering into random situations and observing what happens next. His life becomes inexplicably—and inextricably—intertwined with that of a dull bellboy named Todd (Elijah Wood), when the latter walks into a bizarre murder scene in the penthouse of his hotel. “Have you noticed an acceleration of strangeness in your life of late?” Gently asks, motormouthed, after breaking into Todd’s apartment later that night. Between the torn-apart bodies, the blood-soaked lottery ticket, and the vision Todd caught of his own ranting future self, it’s safe to say he probably has. Written and produced by Max Landis, the show takes its title, some of its tone, and its deuteragonist’s name and methods from a novel by The Hitchhiker’s Guide To The Galaxy author Douglas Adams. But where Adams’ book was a meticulously crafted pocket watch—delicately placing time travel, alien ghosts, and geometrically impossible sofas into a compact package with nary a loose end—Landis’ show feels big and messy. Assassins travel the roads of America, casually killing everyone they meet. Gunshots ricochet a dozen times and save a life half a block away. It’s a swirling Rube Goldberg machine of violence, chaos, and coincidence. That’s not necessarily a bad thing. In its best moments, like the conclusion of its pilot, Dirk Gently confidently throws a dozen balls in the air with an apparent disregard for where they’ll come down, daring you to trust it with a con artist’s unwavering smile. That final scene presents an intoxicating moment, bouncing between the show’s entire cast of disparate characters and their unsuspected collision courses with each other, managing to sell the idea that there’s some underlying structure that all this strangeness is building toward. But that courage never lasts as long as it should. The second and third episodes see a damning slip in the show’s confidence, with characters hammering in old information and concepts ad nauseam. And there’s only so many times Dirk can shout “it all fits together” before it stops feeling like an ethos and more like Landis and company desperately begging the viewer to play along. Even worse, the second episode commits a cardinal sin by attempting to shoehorn in an underlying rationale for the show’s more overtly fantastical elements. Introducing a shadowy CIA group with its fingers in Dirk’s past stinks of comic book secret origins and a lack of faith in its audience. 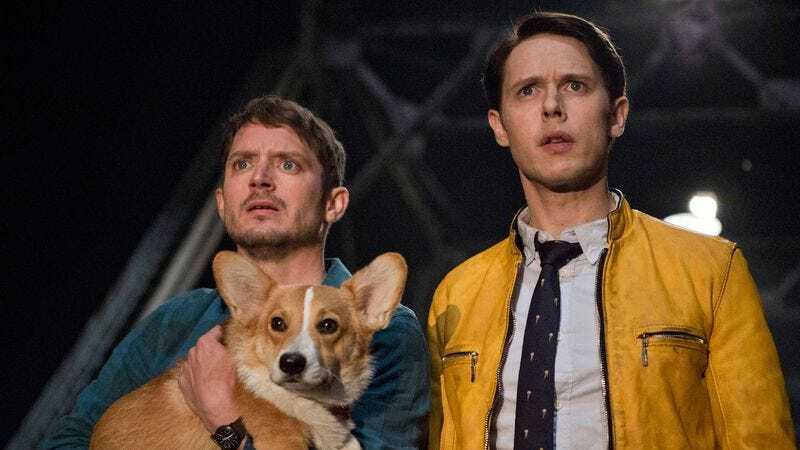 Like its source material, Dirk Gently is fundamentally a mystery. When the show rushes to give viewers something more concrete to hold onto, it undercuts that thrill. Luckily, the show’s leads are there to buoy things. Wood is in familiar straight-man territory, but he invests Todd with a veneer of twitchy moral decay that suggests there’s less to him than meets the eye. And when the show needs to sell the wonder of a moment, the actor’s wide, boyish eyes are still the perfect vehicle for the job. Barnett, meanwhile, is a real revelation. Promo materials for the show suggested that his take on Dirk might be its biggest weakness, portraying the detective as a smug cartoon quip machine with no respect for other people’s personal space. But the veteran stage actor (and Penny Dreadful alum) wastes little time drilling into the underlying tragedy of Gently’s character. His verbal tics and lack of social cues are played for comedy, but they’re also the signs of a man with no control over his own life. When Dirk tells Todd that’s there’s no escaping the web of coincidences in which he lives, he means it, and Barnett never lets Dirk’s fear of the forces controlling him leave his manically smiling face. A dream sequence in which he imagines himself happily jamming out with Todd and his sister, Amanda (Hannah Marks), surrounded by friends hits those notes of loneliness especially hard. There are highlights: The West Wing’s Richard Schiff was born to play a skeptical cop, giving “The Eyebrows” to suspects. And, despite her own ill-advised trip to The Silly Voices Store, Fiona Dourif gives a great performance as Bart, the aforementioned wandering assassin, who serves as a shadow version of Dirk himself. Guided by the same forces that drag our hero from case to case, Bart kills her way across the countryside, largely on a whim. She even gets her own Todd, in the form of Mpho Koaho’s nerdy hacker/hostage Ken, and the show frequently twins Dourif’s and Barnett’s dialogue to emphasize the connections between the two. But it’s hard to evaluate those links, and Dirk Gently’s Holistic Detective Agency itself, while all those balls are still floating in the air. Is there a method to the show’s madness? And, if so, is it one worth sticking around to watch unfold? These first three episodes present a compelling—if overstuffed and often inelegant—mystery. More importantly, they introduce a team that makes it easy to watch that mystery unfold. As it stands, Barnett and Wood’s dynamic is interesting enough that, even if you don’t buy into the show’s obsessive love for strange coincidences, there’s still an enjoyable core here that might keep you coming back.